The government has urged everyone in a red area to be at home from 4pm today until 12 midday tomorrow. A STATUS RED weather warning has been issued for all counties in Ireland until 3pm tomorrow. The government has urged everyone in a red area to be at home from 4pm today until 12 midday tomorrow and to not take chances on the roads. However, if you absolutely feel like you have to get around, here’s what’s running. 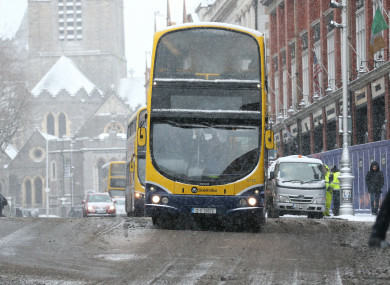 Dublin Bus, Bus Éireann, and school bus services are all cancelled. Some private bus services continued to run: Citylink ran services throughout the morning with the last bus leaving at 12.30pm. Bus Éireann had cancelled services in Leinster and Munster, but has this morning extended that to the whole country. Rail services will operate with delays until around lunchtime. There will also b bus transfers between Limerick and Ennis due to a separate local flooding issue. Services are not expected to resume before 12pm on Friday. The Luas red and green lines are operating full lines this morning, but at a frequency of one every 30 minutes. Services will stop at midday and the company will update customers on whether or not it will run tomorrow later on. 27.02.18 So how will The Beast compare to the Big Snow of '82? The runway at Dublin Airport opened earlier, but many flights are cancelled. “Our snow and ice clearing teams have been working throughout the night in very difficult conditions to keep the runway and airfield clear. “This continues to be a challenging exercise with our teams working in difficult on the airfield. Shannon Airport is fully operational, but is urging people to check with their airline before leaving for the airport. All Irish Ferries sailings from Dublin are cancelled today with the exception of the 8.55pm sailing to Holyhead, which is listed as in doubt. Email “No buses and a Luas every half hour - here's how transport is affected by the snow”. Feedback on “No buses and a Luas every half hour - here's how transport is affected by the snow”.